These are from the family cookbook that my mother put together a few years ago. Cook to light crack stage (285 degrees) (Test by adding a few drops to cup of cold water. The mixture will form a thin, pliable ribbon.). Pour onto a greased cookie sheet and cover with 1 cup chocolate chips or Hershey Chocolate Bar while hot. Sprinkle with 1/2 cup chopped walnuts and let harden. When doubling recipe use 1/2 butter and 1/2 oleo. It will make a jelly roll pan full. Melt 1 cup butter. Add brown sugar, salt and corn syrup. Bring to a boil. Simmer for 5 minutes. Put corn in large uncovered roaster pan. Melt 1 tsp. Butter and add soda. Add to other mixture. Stir until foamy and pour over corn. Let stand for 15 minutes. Meanwhile turn oven to 250 degrees. Stir corn before putting in oven. Bake 1 hour, stirring every 15 minutes. Combine all ingredients except soda and popcorn in 1 1/2 to 2 quart dish. Bring to a boil, then cook on high for 3 minutes. Remove and stir. Cook for 1 minute longer. Remove from the microwave and stir in soda. Pop corn. Clean out any unpopped kernels. Put corn in a brown grocery bag. Pour syrup over corn. Close bag and shake. Cook in bag on high in microwave for 1 1/2 minutes. Take out and shake and cook another 1 1/2 minutes more. Pour into pan and cool or eat from the bag. Mix together sugar, butter, milk, and form into balls, then put cherries in center. Let stand in refrigerator or freezer. Dip into melted chocolate chips and paraffin that has been melted. (Could be melted in microwave) Cherries could be substituted with peanuts. When doing cherries make sure they are completely covered, because they will weep juice if not completely covered. Use peeling from thick skins off of grapefruit and oranges. Peel 1 grapefruit and 2 oranges. Put peeling, 1 cup sugar, and 1 cup water in pan and cook. 1. Boil with water and salt like potatoes. 2. Scrape white pulp off when tender when pricked with a fork. 3. Put peelings in sugar and water and boil down till transparent. Watch closely. 4. Snip into strips and roll in granulated sugar. Melt oleo in eagle brand milk. Add coconut and powdered sugar. Spread on a cookie sheet pan. Refrigerate 30 to 45 minutes or overnight which is best. Cut in squares. Dip in melted chocolate and wax. Place on wax paper. Optional: Use milk chocolate and put almond in the middle. Melt butter, add pudding just as it comes from package and stir until well blended. Add milk and bring to boil. Boil 2 minutes stirring constantly. Cover. Remove from heat and add sugar, vanilla, and nuts. Stir until mixture is smooth. Shape into egg shapes. Place on tray covered with wax paper. Chill thoroughly. Coat with melted chocolate and some paraffin. Chill again. Store in tightly covered container. *vanilla pudding, almond extract, 1 1/2 cups coconut instead of nuts. *butterscotch pudding, vanilla and chopped walnuts. Boil slowly until it turns a Carmel color and form a firm ball in cold water. Remove from stove and add vanilla. Beat until stiff and add nuts - when stiff pour into buttered pan and let cool. Cream butter and blend evenly into the sugar. Stir in coconut and nuts. Add milk and work mixture into stiff dough. Form into 1 inch balls and chill them thoroughly several hours or overnight. Melt paraffin and chocolate chips. Dip balls in chocolate and place on wax paper. Refrigerate until used. Can melt chocolate and wax in microwave. During dipping you might have to reheat mixture. Boil sugar and milk until soft ball stage. Remove from fire. Add coconut and butter. Beat until creamy. Then drop by spoon on waxed paper. Spread freshly popped corn on 1 large sheet pans and keep warm. 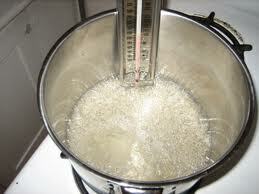 Combine oleo, sugar, syrup, and salt in 2 qt. heavy saucepan. Boil to firm ball stage (248 degrees) about 5 minutes. Remove from heat and stir in baking soda. Syrup will foam. Pour syrup over corn and stir. (Hard to mix at first, easier after corn is in oven a while.) Bake 35-40 minutes, stirring every 10-15 minutes. Janet uses microwave popcorn. Make sure unpopped kernels are removed before adding syrup. Mix the mashed potatoes, butter, vanilla, and cream together. Then add the powdered sugar a little at a time mixing well. You will need to knead the dough till its firm enough. Form into balls, Freeze before dipping chocolate coating. An make ahead of time and freeze to store. You may add different flavored extracts. Also different food coloring if desired. Dipping chocolate: Hershey's chocolate bars and small amount of paraffin. Store in air-tight containers. You might need more powdered sugar. Form into balls. Freeze. Dip in chocolate. Store in airtight containers. Boil all together except the flavors and/or colors to a hard ball stage. Check by putting a few drops in a cup of cold water. When finished add flavors and/or colors. Pour on buttered cookie sheet. Let slightly cool. Candy will still be very hot. Butter hands before starting to pull. Divide up and pull until creamy looking. After pulling to desired creamy look twist ropes of taffy. After hardening break into pieces and wrap. Store in airtight containers.